Indie movies are often hard to recommend. They tend to be very different from the usual fare you see in theaters, and not always in a good way. In some ways they can be more rough than their big budget counterparts, often having to rely on their uniqueness rather than flashy special effects. Sometimes this works. Sometimes it doesn’t. The Babadook is one of those times where it does. Let me get something out of the way: I’ve been planning on watching this movie for a long time but due to multiple factors (including my own laziness) I never got around to it until now. But I’m glad I did, because The Babadook is something that I’ve wanted out of modern horror movies for a while. It’s actually about something. It has a point, a theme behind it that drives the movie and its horror. Compare this to most modern movies, like Paranormal Activity or Insidious, where the sole point of the movie is to scare you. The Babadook is an Australian indie horror movie that centers around Amelia Vanek and her son Samuel. The movie opens with Amelia having a dream about her husband, who we find out a little bit later died in a car crash while rushing Amelia to the hospital to give birth to Sam. From the very beginning of the movie you can tell that the relationship between mother and son is a little strained. When Sam hears monsters in his room, Amelia reads him a bedtime story and then sleeps with him. But in the middle of the night, she brushes his hands off her and scoots to the other side of the bed. As the film progresses we see that Sam has some emotional issues. He insists on creating weapons to battle imaginary monsters and Amelia is actually called in from her job as an assisted living nurse to his school when he brings one of his creations there. Frustrated with how they’re treating the situation, calling Sam “the boy” instead of by his name, Amelia pulls him out of the school and vows to find him a better one. But then, one night a red book mysteriously shows up in Sam’s room. Its title is “Mister Babadook” and the monster it describes becomes Sam’s new obsession. First and foremost my favorite thing about The Babadook is that it relies on tension and spooky visuals rather than cheap jumpscares. If you read my review of Blair Witch that I wrote last month you’ll remember that was one of my primary complaints about the movie. It was obvious that it was an artificial experience meant to scare you rather than tell an interesting or meaningful story. It focused too often on jarring audio cuts and things jumping out in front of the camera rather than atmosphere or tension. Not so with The Babadook. The movie keeps you unsettled, especially with its scenery shots, showing dark and unnerving shots of the house at night. At one point it shows a time-lapse of dark clouds filling the sky, creating a surreal feeling as you watch. As I said, the movie prefers tension over shocking the viewer with loud noises. In fact, it’s not really until the movie hits the half hour mark that anything notably supernatural starts to occur. Up to that point there’s a few bumps in the night and such, but that’s it. Things really start to get creepy after Amelia tears apart the Babadook book, frustrated with how it has affected Sam. But later on, she hears a knock on her front door. And when she goes to look, she finds the red book sitting on her front step, pages taped back together. Not only that, but there are now new pages made with the intent to taunt her, saying that the more she denies the existence of the Babadook the stronger it becomes. For fear of spoiling any more, I’m going to stop talking about the story there. Suffice it to say, it’s not always a fun movie to watch. It’s gut-wrenching and raw. And it does all of this without any gore or exaggerated horror elements. For example, the scene with the cockroaches coming out from behind the fridge could have easily veered into cheap gross out territory, but it thankfully doesn’t. Nah I’m not creeped out. Are you creeped out? I’m not creeped out, no way. And the movie also holds back when it comes to the appearances of the monster. You never get to see a whole lot of it during the film, usually catching only quick glimpses (although you see a decent amount during its first major appearance while Amelia is in bed). 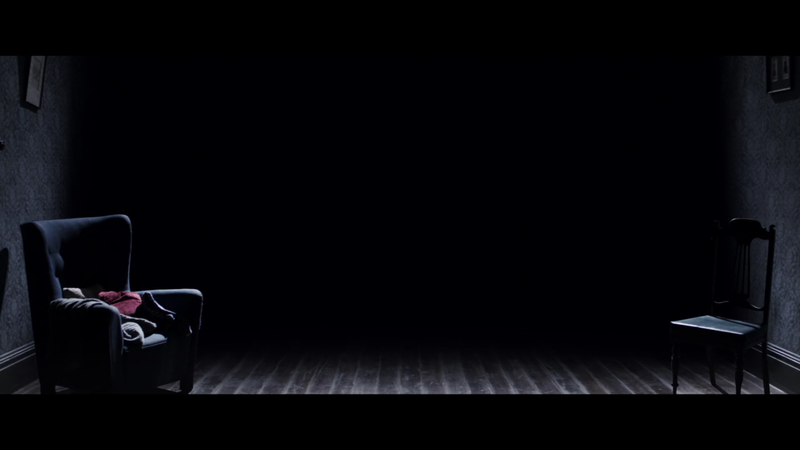 And on top of that, the Babadook says very little throughout the movie, making the creature even more mysterious. Interestingly, I found out that for the monster the director decided to use stop-motion effects, as she wanted the movie “to be all in camera.” Initially I thought the approach was a little goofy, but the longer the movie went on I realized that it enhanced the surreal nature of the experience. In fact, if there’s one thing I can really complain about with the presentation of the monster it comes from the sound department. One of the noises the Babadook makes is a strange, stock dragon roar that I know I’ve heard somewhere else (from a video game I think). It seems out of place compared to the rest of the sounds, and every time it briefly pulled me out of the experience. 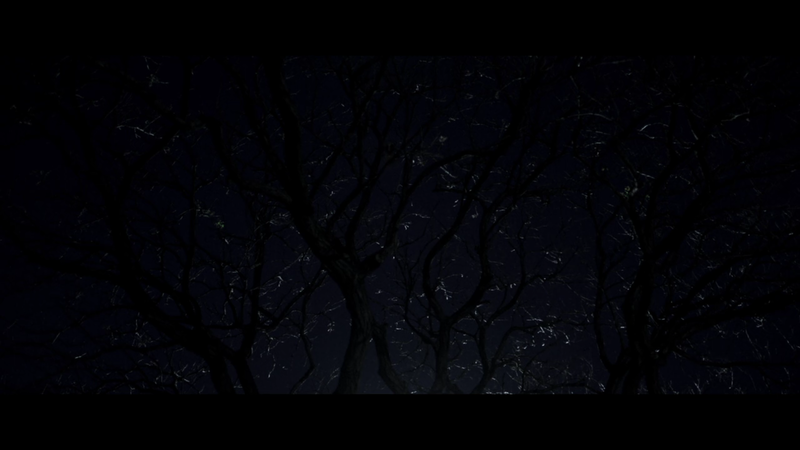 Speaking of being surreal, the movie plays with light and shadow at times, creating an interesting atmosphere. Speaking of criticisms, the only other major problem I had with the film involved the ending. The ending works as it is, showing us the resolution between Amelia and Samuel’s characters, but we don’t really get any resolution with any other characters in the movie, which I thought was strange since the movie spends a lot of time showing how things fall apart between Amelia and others, specifically with her sister Claire. It seems like a missed opportunity to me. The other thing that bothered me about the ending has to do with the Babadook itself. I won’t go into specifics, but part of the ending feels like it happens simply out of consistency for the rules they made up relating to the monster. It probably has a deeper symbolic meaning, but for some reason that bit of the movie’s ending just stood out to me as being different from the rest of it. But in the end The Babadook has a lot of heart in it. The actors who play Amelia and Sam are great, convincingly portraying the strange relationship between mother and son. Amelia always appears tired and worn, but tries her best to take care of Sam and truly does love him. Sam in turn loves his mom and says more than once that he wants to protect her. He speaks his mind, which as the movie shows doesn’t always have the best results. But together the two of them form a sympathetic pair that serve as the driving force of the entire movie. 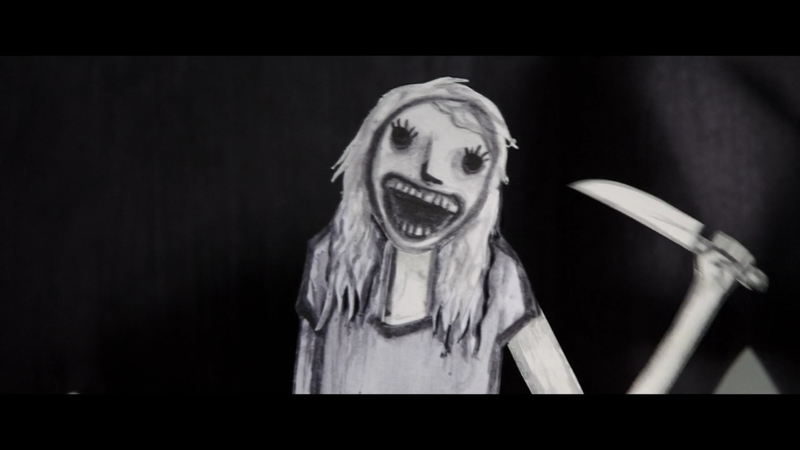 It might sound cliche to say, but The Babadook is more than just a spooky movie. It’s about something altogether human. And the Babadook itself is more than just a monster. It’s a metaphor waiting to be interpreted by the audience. I highly recommend this movie if you like horror movies. Even if you don’t I still would because of how unique and powerful it is. It has a greater aim in mind than simply being a scare fest, although I will say it certainly succeeded in getting under my skin at times, especially during the latter half. But it succeeds because substance and style work hand-in-hand to create a truly atmospheric experience. It’s not always a pleasant movie to watch, but it will certainly stick with you for a long time. Where would that man be now? Thanks for reading! This was something a little more experimental than what I usually do, so let me know if you enjoyed it. Check back next Wednesday for another post, and as always, have a wonderful week. Anybody who’s followed my blog probably knows that I’m a big fan of video games, with them being one of the primary ways I spend my free time. Now, there’s a lot of different thoughts and ideas floating around out there about video games and how they relate to us. Here are five of those thoughts that I disagree with. Television shows and movies have plenty of violence, yet they don’t get nearly as much criticism. There is no scientific study or literature that conclusively shows that playing violent games leads to a higher chance of committing violent acts. In regards to the first one, I understand that one of the primary concerns with video games is the interactive nature of it. Instead of passively watching the main character shoot a few dozen dudes, you are actively participating. But like I said with point number two, no study has ever proven anything beyond the fact that playing video games may lead to increased aggression. The other main issue with scientific studies into violent games is that many of them are flawed. I remember reading about a study that took place while I was in high school (around 2005 or so I believe). Basically they had two groups of people, one playing Wolfenstein 3D and another playing Myst. After about an hour or so of playtime, they brought these two groups together and gave them air horns. What they found was that the group that played Wolfenstein 3D would honk the air horn for longer periods of time than the people who played Myst would. I think you can already spot some of the flaws here. This study took place in roughly 2005, which means that at that time, Grand Theft Auto: San Andreas had already been released the year before. And even if the study took place before it, there were other Grand Theft Auto games they could have used. So then, why did they choose two games that were released a decade earlier in the 1990’s? The other issue is the air horns. Using an air horn does not translate to intent to commit violent acts. Now, you can’t take a group of people and hand them guns (because that would be really REALLY bad), but air horns do not strike me as a good metaphor for increased aggression. And this is the problem with most studies into the subject. They don’t have a good way of interpreting the effects of games because they usually study subjects in a one-off manner, having them play a game and then seeing how they act immediately after. It doesn’t take into account other factors that could contribute to this alleged aggression increase. Besides, the juvenile crime rate in the 1990’s was on the decline, which is the same decade that video games began their rise to prominence. So there’s no solid evidence to support the idea that violent games cause more real life violence. This is another one I heard when I was growing up. And while it is true for certain games (the Call of Duty franchise comes to mind), there are plenty of games out there that are more than just “mindless”. Myst is one of the games I had growing up that was anything but mindless. There were no enemies to fight. All you had were your wits to solve the many puzzles laid around the island and uncover more of its secrets. In fact, I remember my brother actually had a notebook journal dedicated to writing down clues for the game. But Myst is not the only game that serves as a counter to the mindless argument. Spec Ops: The Line is a game I have yet to play, but one that I want to get around to at some point. It’s a game about a soldier who goes to a far off country to deal with what seems like a normal mission. But when he gets there, things start going Apocalypse Now, with the main character’s sanity slowly degrading throughout the story. The game is supposed to feature some of the most interesting and complex moral choices of any game ever. For example, there’s one scene where you’re tasked with shooting someone who’s running away. Now the two choices are clear: shoot him or don’t. But apparently, there’s a third choice to be made in there. You can shoot at the person but miss on purpose, making it look like you were fulfilling your orders but allowing the man to live. And the game doesn’t tell you that this exists. You just find that out on your own. 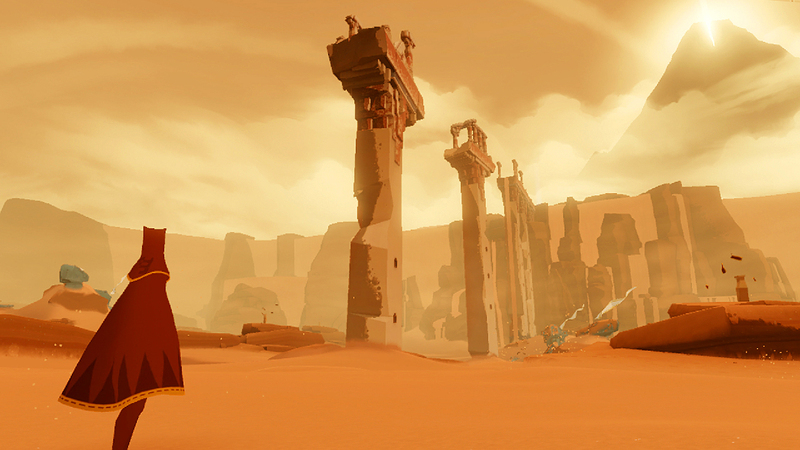 There’s also Journey, a game where you play as a nameless, faceless figure wandering a surreal desert landscape. But it’s more than just that. Journey is also a bit of a social experiment in that as you wander through the game, occasionally another player will be inserted into your game. You can’t talk to each other or communicate (aside from gestures I believe), and you can’t identify each other either. You can only make the decision to work together or ignore each other. There’s also Papa & Yo, a game about a boy and his monster friend which was an allegory for the creator’s experience with an alcoholic, abusive father. There’s Neverending Nightmares, a psychological horror game in which the creator drew upon his own personal experiences with depression and obsessive-compulsive disorder to replicate a sense of bleakness in the game similar to what he felt in real life. And there’s Gone Home, a game about a girl returning home and discovering all that has happened with her family in the year she’s been studying abroad. So no, games are not just mindless entertainment. They have plenty of potential to talk about complex and difficult subjects. This is one I ran into fairly recently, and is what inspired me to write this post. It comes from a Cracked.com article entitled “4 Things Gamers Think Are Important (But Aren’t)”. In the article, the writer talks about people who play games have come to expect movie-quality stories from their games. Now, I get what he’s saying here. Often the gameplay and the story of a video game can feel like they’re in separate worlds. When the story world appears, control is usually taken away from the player as they watch a small movie within the game. It creates this disconnect that sometimes hampers the experience of the game overall. But while the author complains that calling the stories of games “stories” is simplistic, reductive thinking, I would argue that his reasoning is simplistic as well. It is certainly true that many games with quote unquote “deep stories” tend to have their story sections get in the way of playing the game, but there are plenty of other ways games can tell a story. For example, when two people who play games talk to each other, you’ll sometimes get these stories that start with “well this one time I was playing (insert game here) and this totally crazy thing happened”. This is something fundamentally unique to the video game medium. You don’t read a book and have some totally unexpected thing happen that didn’t happen to anyone else reading the book. But in a video game, there is the potential to create events and stories that even the people making the game might not see coming. I talked about a game called Salt in a recent post, and I think that serves as a good example of this. Salt is all about the player’s journey. There’s very little overarching story created by the developers (although that could change as it is still in development). In the post I made a joke about how you could use the game’s journal feature to write a diary of a man going slowly insane. But isn’t it cool that you are even allowed to do that? You can literally tell your own story within the game, because it’s all about the things you discover and experience. And considering that the world is procedurally generated, no two player’s experiences will be exactly the same. They won’t discover the exact same island as each other (well, until they add multiplayer that is). In short, games have story possibilities that no other medium has to date. Oh boy, haven’t I heard this one more times than I can count. In much the same way as rival sports teams have fans that will incessantly fight each other over which team is better, video games have fans of formats that will fight each other over which is superior. Let me get something out of the way. For most of my life, I have been a console gamer (meaning that I played on things like the Super Nintendo, PlayStation, and so on). It’s what I grew up with, not to mention the fact that I prefer sitting back with a controller to being hunched over a keyboard and mouse. Yes, I understand that keyboard and mouse is more precise. Yes, I understand that PC games have better graphics than console games. I just don’t care. Now, I will admit that for the last few years I have used my desktop computer to play games far more often than I have consoles. I bought an Xbox One a couple of years ago, but I barely use it these days. There just aren’t enough interesting games coming out for it, not to mention that I can get more games for cheaper prices on my computer. But in the end, I will always prefer the feel of a controller over the feel of a keyboard and mouse. It’s just more relaxing to me. Besides, isn’t personal preference what it all comes down to in the end? Why are we gamers constantly fighting over this nonsense? Just play what you want to play and be happy with that. Arguing over which format is better just sounds pretentious. Do you see what the issue with this definition is? It’s too nebulous. It doesn’t have a clear definition for what can and can’t be considered art. And that’s exactly the point. Look, this might sound funny coming from someone who wants to write books, but I don’t care if video games are art or not. It doesn’t matter to me. Because regardless of everything else, I consider games to be a form of expression, art or not. And besides, hasn’t it always been said that art is in the eye of the beholder? Do you consider games to be art? Good for you. Do you consider games to not be art? That’s fine too. In a way, you’re both right. To me, art has always been a matter of perspective. The definition from Google talks about how art is appreciated for its beauty and emotional power, but these two things are incredibly subjective. I can’t hold up a painting and say “this painting has emotional power” because for some people it might not have that power. To some people it might seem boring or uninspired. To others, it might even be deemed offensive or insulting. The fact of the matter is that whenever I look at something I am seeing it through my own eyes, through my own experience. And while I play Gone Home and see it as a touching, emotional experience, others play the game and see it as boring and stupid. Trying to nail art down to a concrete, scientific definition ignores one of the fundamentally great things about being human: we are all different in our own unique ways. We all have our own perspectives, our own experiences. And we use these things to shape our own unique path through life, our own unique story. So the dust has finally settled. The people have spoken and a new president has been chosen for the United States. Am I happy with the results? No, I’m not. I don’t like Trump and I think some of his more extreme ideas could be damaging to our country. I’m disappointed with the results of the election. But it happened. Now the question is what to do moving forward. And to that end, I wanted to send a simple message out on this day after election day. Whether you’re a conservative or a liberal, republican or democrat, just be nice to each other. So much hate and nasty comments have been thrown around this election. Not only that, but there was a lot of doom-saying going on. If you were a Trump supporter, Hillary was going to start World War 3. If you were a Hillary supporter, Trump was a fascist and would destroy democracy. There seemed to be very little middle or common ground in this election, and that worries me. I’m worried that people won’t listen to each other or compromise on anything. I’m worried people will give up on politics more than they already have. I think part of the reason Trump won was because people in my generation are so convinced that their votes don’t matter that they just didn’t vote. I saw something like that happen with Bernie Sanders supporters after he lost the primary. Now let me be clear, I supported Bernie a lot and I really wish he would have been nominated. But just because he lost that nomination didn’t mean that his ideas or his cause were lost. It’s the same thing now. We can all still work together to find compromises and make sure that people get what they want. We don’t need mindless hatred. We need to come together. We need unity. After all, aren’t we all sick of those bombastic negative political ads? Most of us, even those who didn’t vote, are probably breathing a big sigh of relief that those are over with. And I can echo that sentiment. Here in northern Minnesota, the 8th district congressional race was one of the most heavily advertised in the entire country (if not the most). It felt like I couldn’t go a single commercial break at work without seeing an ad for either Rick Nolan or Stewart Mills. This election seems to have nailed us into two separate camps that aren’t allowed contact with each other. If you were a liberal, you hated conservatives. And if you were a conservative, you hated liberals. But the thing is, they’re just opposite sides of the same coin, two ways of looking at the same world. Instead of pretending that they are separate and incompatible, shouldn’t we be trying to find some middle ground? Shouldn’t we be looking for the ways we connect instead of the ways we don’t? I may not like Donald Trump, but I’ve tried to understand why people would support him. And I understand it in a way. People are sick of the same old nonsense. They’re sick of politicians constantly bickering, never getting anything done, and paying more attention to their special interests than their constituents. I don’t think Trump is the answer to that issue, but I can somewhat understand the frustration people feel and why that would drive them to vote for him. And then you hear about stuff like those shootings at a California polling place last night and it makes you wonder. Is this really how far we’ve gone? Is this really how much we hate each other? Are we really so divided that we’re willing to shoot each other over who’s voting for who? I don’t know. But I do know one thing: there is more that binds us than separates us, and we would do well to remember that. It sounds like something from a feel-good movie, but I truly believe it. The whole reason society has succeeded thus far is because we as human beings are capable of working together. Once all this election stuff leaves our system, I think we would all do well to remember that. Because if we work together, we can make the world a better place for ourselves and for future generations of humans. Because that is what we are in the end. Despite our differences, we are all human. Well that’s all I have for this time. Check back next Wednesday for another post and as always, have a wonderful week. I know that Halloween was two days ago at this point, but I can’t help but use the opportunity to once again complain about the state of one of my favorite story genres. I’ve spoken about this topic several times before, but I never went too in depth on it. I mostly lamented how horror uses tropes as a crutch, continually making stories without any real stroke of originality. Also demons. I’m really REALLY sick of demons. But in the end, demons are only a symptom of the problem. To find out where the horror genre went wrong, we have to start by taking a look at some of the classic horror movies. I’m going to be using The Thing (1982) as my main example here. The Thing is a movie about a group of antarctic researchers who are hunted by a malevolent alien entity that can assume the form of its victims. It carries a palpable sense of tension and dread throughout the entire movie, as the characters have no idea if the person next to them is the alien or not. The Thing is a slow-paced movie, choosing to focus on the paranoia brewing between its characters rather than the horrific appearance of the unmasked alien monster (even nowadays the contorting of the alien’s form is pretty gross to look at). And this is where its greatest success is, focusing on the characters instead of the monster. The paranoia between them can even be seen as an allegory for the Cold War paranoia that was still present in the country at that time. By contrast, what is Paranormal Activity about? Well…uh…two people being dicks to each other for most of the movie instead of using their time to battle the demon that has LITERALLY BEEN FOLLOWING ONE OF THEM SINCE CHILDHOOD?! Don’t get me wrong, I very much enjoyed Paranormal Activity. But this is the problem I see with modern horror films. They’re not really about anything anymore. They’ve become mostly soulless, vapid popcorn flicks, meant only to elicit momentary frights. Once you’ve left the theater though, all the terror that you may or may not have felt evaporates. Nothing lingers in your mind because there is nothing to linger. It’s all just loud noises without any subtext. Recently I wrote a review of Blair Witch, which is a direct sequel to the original Blair Witch Project. And while I lamented the fact that it was basically a shadow retelling of the first movie (which makes sense in a way since the first movie came out seventeen years ago), I more lamented the fact that it was just chock full of scares that had no purpose other than to make you jump. It gets so bad that at one point, when they jumpscare you twice in a row, one of the characters mutters “stop doing that” under her breath in the movie’s attempt to make a self-referential jab at itself. And that’s another thing I hate about modern horror films. They’ll crack jokes like that about themselves as if being self-aware of how cliché they are makes everything better. You can write a horror story about people making bad decisions (and let’s be honest, all horror movies are pretty much characters making bad decisions) without pointing that fact out. It doesn’t make your story better to do that. If anything it breaks the immersion for the audience by making them even more aware that this is an artificial construct made solely for the purpose of scaring them. Horror didn’t used to be like that. Take The Shining (1980) for instance. The Shining didn’t really feature a visible monster or demon of any kind. It was more about an omnipresent evil taking advantage of Jack Torrance’s already present weakness due to his alcoholism and anger issues. In this way, the evil becomes a reflection of what’s already there, instead of just being some foe the characters attempt to defeat. Even The Exorcist (1973), one of the original demonic possession movies, was about more than just “ooh demons…spooky scary!” It was about the family and how the event affected them. It was about the priest who lost his faith and must find himself again. It was about the corrupted innocence of a child beset upon by evil. It wasn’t just about cheap thrills. It was about trying to unsettle the audience in ways that went beyond gore and loud noises. It sounds weird, but to put it simply horror movies seem too focused on trying to be scary instead of actually being scary. And to me it seems to have started with the rise of slasher flick movies in the ’80s and ’90s. Now I hate to do this, because I don’t like generalizing a whole genre of anything. And I understand that Jason Voorhees and Freddy Krueger are iconic horror characters. But I can’t help but feel that slasher flicks marked the turning point. The rise of slasher movies meant that horror movies went from having deep, involved stories to having flimsy pretexts for watching teenagers get hacked to pieces. Like I said, I hate to generalize like this, but it seems to me that these movies almost fetishized violence in a way. And following that, horror movies become less and less thematic and more and more shallow. As much as I like Paranormal Activity, any sense of terror I feel when I’m watching the movie fades away the moment it’s turned off. Nothing really lingers. I don’t feel any sense of creeping dread. I don’t find myself looking over events in the movie, searching for hidden meanings or anything like that. All of it is very surface level when it comes to being scary. It’s not something like Invasion of the Body Snatchers, where the pod people are really just an allegory for the Red Menace (AKA Communism). Instead it’s about a demon who spends the entire movie just messing around with the main characters instead of killing them outright. You know, because reasons. There’s no rhyme, reason, or logic to it. It’s just meant to drag you along for an hour or two until its inevitable conclusion. Although there may be a light at the end of the tunnel. There have been more horror movies as of late that eschew the normal formula. Like The Witch, a movie which just came out earlier this year. I haven’t seen it myself, but from what I understand it takes place in the 1600’s and focuses more on a family slowly turning against each other rather than some kind of monster. It’s supposed to be a dark, brooding movie rather than a loud, brash one. There’s also 10 Cloverfield Lane, which some may argue is more of a thriller, but it still has horror elements to it. 10 Cloverfield Lane traps its characters inside a handcrafted survival bunker while some unknown catastrophe may or may not be happening outside. But the true creep factor of the movie comes from John Goodman himself. Throughout the entire movie you’re never sure if you can trust him. Just when you start to, something else comes to light that skews your opinion of him once again. It’s a tense movie that never lets up, and that’s what makes it so great. That’s what I want to see more of in horror: tension and suspense that isn’t just a setup for an eventual jumpscare. I want a character to be able to walk down a dark and spooky hallway without it always ending with someone or something jumping out at them like an older sibling playing a prank on you. I want characters who don’t feel like monstrous idiots who deserve everything that’s coming to them because they ignored the obvious warning signs. Horror works best when it places believable, complex characters in unbelievable situations. We don’t need more walking stereotypes with the IQ of a bag of rocks. And seriously, stop with the demons. We get it, Ouija boards are bad news. Enough already. Well that’s all I have for this time. Check back next Wednesday for another post, and as always, have a wonderful week.